The new microfluidic technology developed by the UGA researchers—in which individual cells are encapsulated in droplets and tagged with a fluorescent protein—provides scientists with a stable platform to track tens of thousands of cells with single-cell precision, according to Zhaojie Deng, a Ph.D. candidate in the College of Engineering and the lead author of the study. The team’s findings were published online Oct. 27 in the journal Scientific Reports. In the study, Deng and her colleagues were able to monitor more than 25,000 individual cells of Neurospora crassa, a type of bread mold often used as a research model. Not only did they confirm that many cells had a distinct circadian rhythm, they also observed the individual cells synching their rhythms over time. The researchers say the new process outlined in the study also will allow scientists to observe and gather data from cells over a longer period of time than has been possible in the past. Mao says monitoring large numbers of N. crassa cells is difficult work because each cell is only 10 microns in diameter. By comparison, the average cross-section of a human hair is about 100 microns. “If you want to measure tens of thousands of individual cells at the same time, each cell must be extremely stable and stay in place for up to 10 days or you lose track of them,” Mao said. The researchers say their findings may eventually lead to advances in a number of areas where the circadian rhythms of organisms play a role. “You might want to exploit the biological clock of algae to make biofuel reactors more efficient or you might want to understand the synchronization phenomenon of agricultural pests such as locusts,” said Jonathan Arnold, a professor in the Franklin College of Arts and Sciences’ department of genetics and a corresponding author of the study. 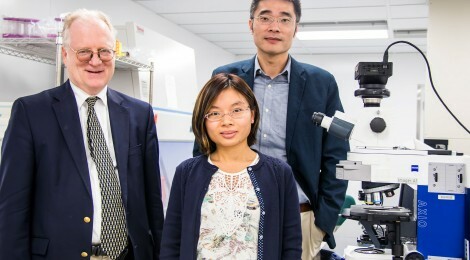 The team’s study provides tools and approaches that might even shed light on the synchronization of cells in the master clock of the human brain, according to Arnold. He notes the behavior of the human master clock has been tied to health problems such as heart disease and cancer. In addition to Deng, Mao and Arnold, the research team includes Taotao Zhu, a Ph.D. student in the College of Engineering; Sam Arsenault, a Ph.D. student in the department of entomology; Cristian Caranica, a Ph.D. student in the department of statistics; James Griffith, a research coordinator in the department of genetics and in the College of Agricultural and Environmental Sciences; Heinz-Bernd Schüttler, a professor in the department of physics and astronomy; and Ahmad Al-Omari, an associate professor in the department of biomedical systems and informatics engineering at Yarmouk University in Jordan. This research is supported by the National Science Foundation under Grant Nos. 1150042, 1242030, 1359095, 1426834; and by the National Institute of General Medical Sciences of the National Institutes of Health under Award No. R21GM104528.